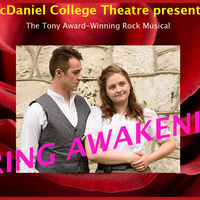 McDaniel College Theatre presents the Tony Award-winning musical “Spring Awakening,” November 14 through November 17 at 7:30 p.m. in WMC Alumni Hall. The musical, which has a book and lyrics by Steven Sater and music by Duncan Sheik, is directed by McDaniel Theatre Arts department chair Elizabeth van den Berg. The winner of eight Tony Awards, including Best Musical, “Spring Awakening” explores the journey from adolescence to adulthood with a poignancy and passion that is illuminating and unforgettable. The landmark musical is an electrifying fusion of morality, sexuality, and rock and roll that has proven exhilarating to audiences across the nation. “Spring Awakening” tells the story of two star-crossed lovers: the brave and brilliant Melchior and a naive, young girl, Wendla, from a repressed family. The musical follows this turn of the century Romeo and Juliet, their friends, and their families, as they navigate, and are impacted by, teenage self-discovery, first love, and coming of age anxiety in a powerful celebration of youth and love. The cast includes McDaniel students Allisa Baker, Mikayla Braswell, Nailah Calhoun, Nichole D'Anna, Matt Foley, Bryant Gutnecht, Trevor Haupt, Abigail Hayden, Cade Lee, Daniel Marken, Ben Michaels, Mandy Murren, Anna Odell, Darrick Rowe, Anna Rozier, Sam Trapp, and Patsy Zetkulic. Alison Shafer serves as musical director and choreography is by Julie Herber. Tickets are $10 for adults and $8 for seniors, students, military, and the McDaniel College community. The show contains adult material including mature language, violence, teenage suicide, and sexual situations. For more information, call the box office at 410-857-2448.